High heat over the weekend produced a surge of new fires burning throughout Colorado and also provided fuel and devastating growth conditions for the fires already burning. There are a total of ten major fires affecting Colorado as of Monday, all part of the worst wildfire season in a decade. High Park Fire: The largest of the Colorado fires currently burning is now the second largest fire in state history as well as the most destructive. As of Monday, the fire has burned more than 83,205 acres and destroyed 248 homes. Waldo Canyon Fire: Burning west of Colorado Springs, the Waldo Canyon Fire has burned 3,600 acres as of Monday -- and it is still growing, according to The Gazette. The entire city of Manitou Springs was evacuated over the weekend because of the fire burning in nearby Pike National Forest. The mandatory evacuation order has been lifted for Manitou Springs on Monday, however Crystal Park is still under mandatory evacuation. Little Sand Fire: Burning for more than a month now, Little Sand Fire has consumed 21,616 acres as of Monday with firefighters having reached 31 percent containment. Located 13 miles northwest of Pagosa Springs, authorities believe the fire was started by lightning in the San Juan National Forest. Treasure Fire: Burning near Leadville, Treasure fire began burning on Saturday afternoon. 320 acres have been burned as of Monday and the fire is 10 percent contained. The source of the fire is still under investigation but is suspected to be human in cause. Springer Fire: Located 3 miles from Lake George, Springer Fire was burned 1145 acres in Pike National Forest, but is now 100 percent contained. No structures have burned and there have been two minor injuries. CR 102 Fire: A fire that broke out Sunday afternoon and was 100 percent contained has been downgraded on Monday to only 75 percent contained, according to 9News. The fire reignited in rough terrain where firefighters had difficulty battling it. CR 102 Fire has burned 300 acres. State Line Fire: Burning near Durango along the Colorado-New Mexico line, the State Line Fire has grown to 350 acres as of Monday, according to the Durango Herald. The fire is 15 percent contained. Weber Fire: Burning near Mancos, the fire is estimated to be burning 8,300 acres on Monday, according to 9News, after rapidly tripling in size over the weekend. Around 100 homes have been evacuated along with a campground. Woodland Heights Fire: An approximately 20-acre fire that was burning in Estes park is now at 100 percent containment as of Sunday. 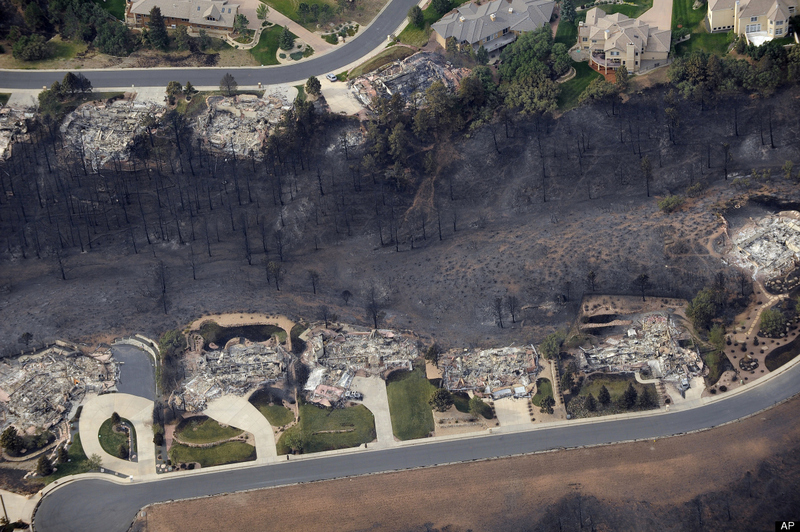 According to the Broomfield Enterprise, the fire moved quickly destroying 22 homes and two out buildings. Trout Creek Fire: A 25-acre fire that was burning in Pike National Forest is now officially 100 percent contained as of Sunday night. 155 pre-evacuation notices were sent out Sunday afternoon.